Explanation: This diverse landscape is the surface of comet Temple 1's nucleus as seen by the Deep Impact probe's Impactor Targeting Sensor. 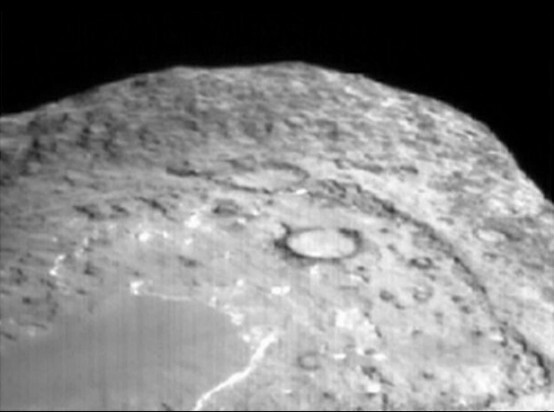 Within minutes of recording the rugged view, the landscape had changed dramatically though, as the impactor smashed into the surface near the two large, half kilometer-sized craters at picture center. Indications are that the probe penetrated well below the surface before vaporizing, sending a relatively narrow plume of debris blasting back into space. Researchers are still speculating on the final size of the crater produced by the July 4th comet crash, but material continues to spew from the impact site and has caused the faint comet to brighten significantly. Determining the crater dimensions and analyzing the debris ejected from the comet's interior will provide premier insights into the formation of comet Tempel 1, a primordial chunk of our own solar system.